This Gorgeous 3/2 Grantham Courtyard Villa has fabulous appointments, a SPACIOUS and PRIVATE outdoor living area, and is ready for IMMEDIATE OCCUPANCY! To truly appreciate all this home has to offer, click on the "tour buttons to view the 3-D and Video. PRACTICALLY NEW, this wonderful home is loaded with over $33,000 in UPGRADES QUARTZ Counters, UPGRADED LAMINATE FLOORING thru-out (NO CARPET), CROWN MOULDING, WOOD CORNICES, + a GLASS ENCLOSED LANAI w/Luxury Vinyl Planking! With an OPEN layout, this extremely popular model is ideal for entertaining. The Kitchen boasts SS Appl., Lg. Breakfast Bar, Custom Pendant Lighting, Upgraded Sink & Pull-out Shelves. The spacious Master Suite has a TRAY ceiling & direct access to the lanai with a slider. The beautiful Master Bath has QUARTZ COUNTERS, DUAL SINKS, extra Cabinets, and the large WIC has additional shelving! The 2 Guest Rooms are perfect for the occasional guest - one with a MURPHY BED. The roomy Guest Bath also has QUARTZ Counters and a Tub/Shower combo. The GLASS ENCLOSED Lanai opens to a N-facing PRIVATE yard with attractive LOW MAINTENANCE shrubbery, plenty of grass for your furry friends + a wonderful PERGOLA with LIGHTING and ADJUSTABLE SUNSHADE for ultimate comfort. The home also has CUSTOM WOOD CORNICES, UPGRADED LIGHTING/FANS, INSIDE LAUNDRY Room + front entry STORM DOOR!!! This BLOCK/STUCCO home also has ARCH. SHINGLES and Gutters all the way around. 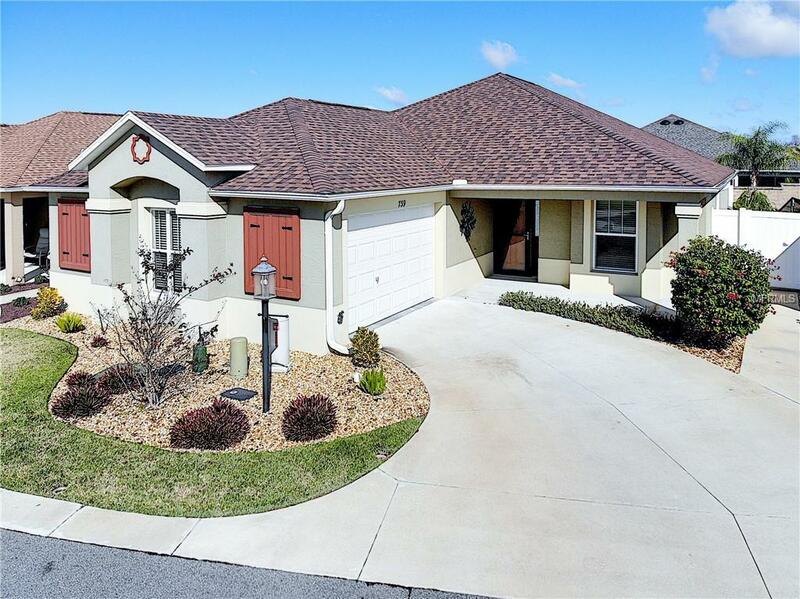 Located in OSCEOLA HILLS at SOARING EAGLE, you'll be proud to call this wonderful villa "home"!